The second annual RedBlackBrown Collective calendar is done and available just in time for everyone who thinks ahead… but not too far ahead. Six designers, three Asian restaurants and 12 fortune cookies went into producing these limited edition, silkscreened, desk calendars. Now we’re looking for 100 good homes and offices where they’ll be well loved by design savvy people who would like something a little snazzier than the calendar the insurance company sends. Printed on cover stock by French Paper Company the calendars reside in a CD jewel case that folds open to stand proudly on your immaculate desk or works just fine closed on a stack of papers you would like to avoid dealing with. Either way it’s your call – just do it with style. Calendars can be acquired from any RedBlackBrown Collective member you can lay your hands on or by clicking your mouse (which you probably already have your hand on) using this link for the RedBlackBrown Shop. I’ve only got one brother but he’s still the best. Enjoy the day Jeff. Thank you for your fun comment on the Re-bookmark-able post Ella. It sounds like you and Tim are having a great time drawing together. The bookmark collection sounds fantastic too. As a thank you and to celebrate Tim’s birthday I’ve sent you each this bookmark you inspired me to make. The sky is full of star signs and Tim can help you find them all. To get you started Cignus the swan is just above the turtle’s nose. Reading and drawing, two great life-long adventures. Keep it up. Maybe those little white mice I occasionally see in the clutches of a magnificent hawk are just getting a ride. 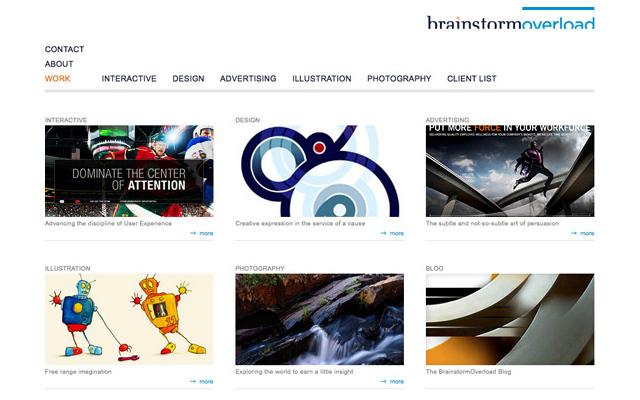 The new BrainstormOverload website is live at long last. Thanks to the tremendous efforts of developer Colin Petit for coding it up and figuring out all the java script madness and to my brother Jeff for early experiments with the navigation. It is amazing how complicated it is to make the interface so simple. There are one or two wrinkles to work out like integration with IE 6.0 and 7.0. But seriously you should not be using those crummy browsers anyway. Upgrade to Firefox or Chrome so you can start experiencing the internet the way we’ve actually designed it. St. David’s Center in Minnesota has provided a supporting environment for children of all capabilities since 1965. It has been a great pleasure to design a new website to support their efforts. Along with my partners Jonathan Anderstrom and developer Colin Petit at Creed Interactive and photographer Josh Hackney we’re celebrating today’s launch. Sometimes it’s nice to have an excuse to get off the computer and simply make something by hand. My wedding (a very informal and fun celebration with home made beer and games rather than champagne and fancy tableware) gave me just such an excuse and here is the result. Four bean bags adorned with slightly sheepish looking monsters – who despite all the teeth are really quite friendly. They are eagerly awaiting August 1st when they will be flung through the air at the corn toss boards I made to go with them. I was originally going to illustrate an alien abduction scene in four panels but my fiancée steered me in a different direction and as usual she was right. The only question is, what to make next? Hey I’ve got an album cover on iTunes! Of course Victor Johnson aka “V” deserves the credit for making the music but it’s still fun to see my illustration/design in such a high profile virtual location. The story on the cover of a new born bird learning to fly while the gaping jaws of a wolf eagerly await the bird’s failure plays out further on the liner notes inside. Check out CD Baby if you want a hard copy of the CD so you can find out how that goes. Victor is back in the recording studio and a new EP should be out around the end of the year which means I’m back in the design studio to create a new cover – which will be on iTunes – which I’ll blog about… it’s an endless cycle. On September 18th you will once again see crazy things going on in parking spaces in downtown Minneapolis and Saint Paul – and around the nation in fact. Started in San Francisco by the Rebar art and design collective Park(ing) Day is a growing tradition where a wide variety of artists (it’s popular with landscape architects here in the Twin Cites) take their creative expression to the streets for a day of thought provoking, curbside installations. I think the design and advertising agencies should consider getting in on things. Why am I bringing this up so far in advance? Because now’s the time for graphic designers to get involved in the T-Shirt design contest. I just submitted mine and want to encourage you to go for it. Whipped cream bears a striking resemblance to an iceberg. A yummy, yummy iceberg.